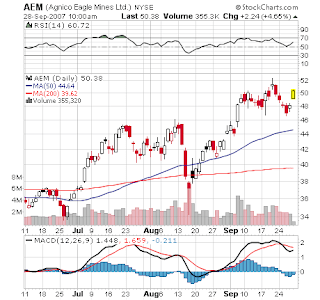 I sold 300 shares of AEM at $50.35 (entry at $46.85) for a $1050 gain (+7.4%). I sold 200 shares of FCX at $107.50 (entry at $105.25) for a $450 gain (+2.1%). 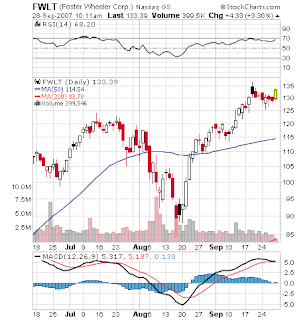 I sold 200 shares of FWLT at $133.32 (average entry $127.88) for a $1088 gain (+4.3%). Update (9:45am): I was stopped out of 300 shares of NILE at $94.55 (entry at $96.55) for a $600 loss (-2.0%). I decided to close out some positions as I expect a dip that will offer better prices in the coming week. I still like all three stocks. 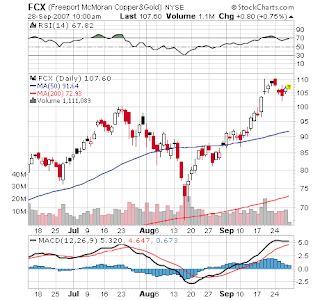 I’m looking for Freeport (FCX) to test its July highs around $100. What do you think? Great job MS, and kudos to TC’s 20/20 hindsight. no mention of AEM through all this. Lighten up TC. The “egg on face” comment was in jest, thus the smiley face. MS, your market correction might start today. I tightened my stop on the weakness and sold out of FWLT as a scratch trade. TNH, POT and FWLT could not hold their gains. This will probably flow into next week.TC, your comments come off as critical rather than constructive because you just point out the negatives. It would be nice to read about more of your set-ups to get a different perspective. i think its time for the naysayers to start their own blog and bide their time that way. I think TC should continue posting. There is no question that both MS and TC are great traders. It adds a lot of content to this blog to have opposing views, helping readers make better trades.